Back to the lasers...they focus on this capsule and create intense heat, causing the molecules on the outer surface to explode. This explosion causes the molecules beneath the surface to move further inward. Imagine a large crowd of people, where those on the outer edges of the group start to push everyone else towards the center. It just squishes everyone together, tighter and tighter. This is exactly how the process of laser fusion starts. All those molecules are pushed into each other in a confined space (compression). And they're moving so fast, that they slam up against each other. This compression, combined with the intense heat, causes them to fuse together, releasing even more energy. 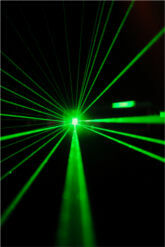 Thus, we have 'laser fusion'. The capsules are about the size of a pinhead, and are capable of releasing the same about of energy as a barrel of oil. This might seem like an incredible source of alternative fuel...you begin to wonder why people are still using fossil fuels. BUT, there are reasons the world isn't using it. Click Here to Find Fuel Alternatives For Sale.